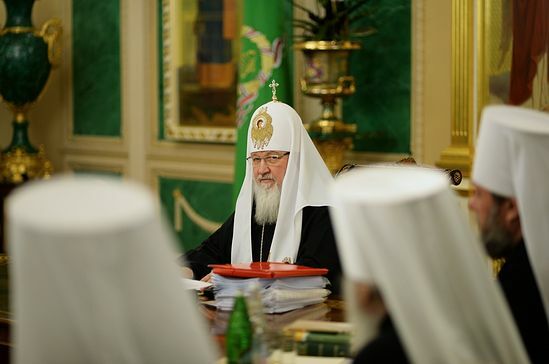 At the meeting of the Holy Synod of the Russian Orthodox Church, held on March 19, 2014, at St. Daniel’s Monastery in Moscow, new vicar bishops of the Russian Orthodox Church outside of Russia and the Latvian Orthodox Church were elected, reports press service of the Patriarch of Moscow and All Russia. Hearing the report of Metropolitan Hilarion of Eastern America and New York, chairman of the Synod of Bishops of the Russian Church outside of Russia, with a petition to confirm election of Priest Nikolai Olkhovsky, cleric of the Eastern America Diocese, as Bishop of Manhattan, vicar Bishop of the Diocese of Eastern America, the Holy Synod passed a resolution to confirm the election of Father Nikolai as vicar bishop of ROCOR (minutes no. 10). The Synod has granted a petition of Metropolitan Alexander of Riga and All Latvia to appoint a vicar bishop for him by confirming election of the cleric of the Diocese of Riga Igumen John (Sichevsky) of Jelgava, vicar Bishop of the Diocese of Riga, at the Synod of the Latvian Orthodox Church on October 11, 2013 (minutes no. 13). By decision of the Holy Synod of March 12, 2013 (minutes no. 18) on the territory of the Krasnodar territory, the Diocese of Armavir was founded, and Metropolitan Isidor of Ekaterinodar and Kuban was appointed its acting bishop. At the present meeting the Synod elected Igumen Ignaty (Buzin), cleric of the Diocese of Tikhvin, as Bishop of Armavir and Labinsk (minutes no. 11). At the today’s meeting the Synod has also examined the question of substituting the vacant see of the Diocese of Kuznetsk, included in the Metropolitan See of Penza. The cleric of the Diocese of Penza Igumen Nestor (Lyuberansky) has been elected ruling Bishop of the Diocese of Kuznetsk (minutes no. 12).